J.D. 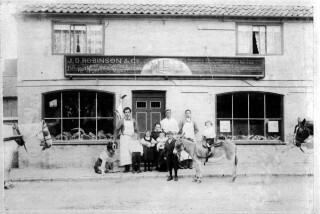 Robinson's and his family in front of their butchers shop on the Market Street, Bottesford. From left to right – the children are: James, W. (b.1893, d.1934); Annie (b.1891); Victoria, M (b.1897) – on the knee of Mrs Caroline Robinson (b. 1856, d.); George (b.1889, d.1941) – holding the donkey; John Richard (b. 1895, d.1918 ‘in the Great War’) – sitting on the donkey. John Richard Robinson's mother (left) two sisters (Victoria, centre, known as 'Queenie' and Annie, right) standing outside the Mill House on Queen Street Bottesford before WW1. According to the family 'Queenie' subsequently ran the 'White Lion' in Melton Mowbray after her parents moved to set up other businesses in St Neots and then Grantham. 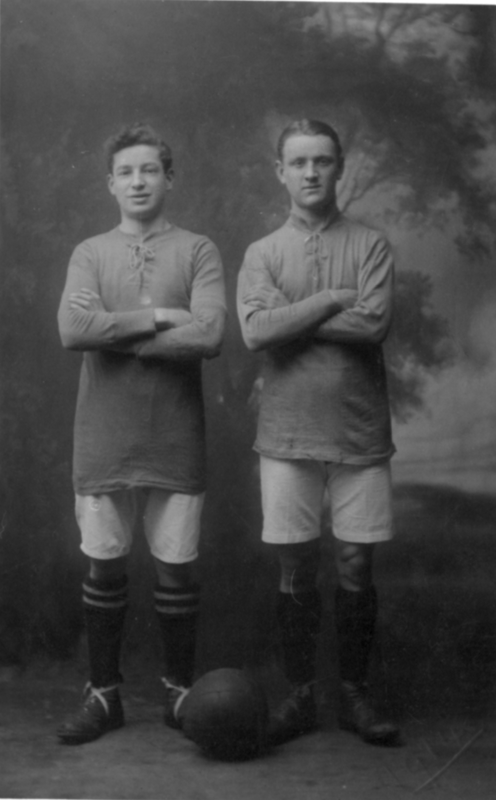 John Richard Robinson was born in Bottesford in 1894, the youngest son of John Daybell and Caroline Robinson. J.D. 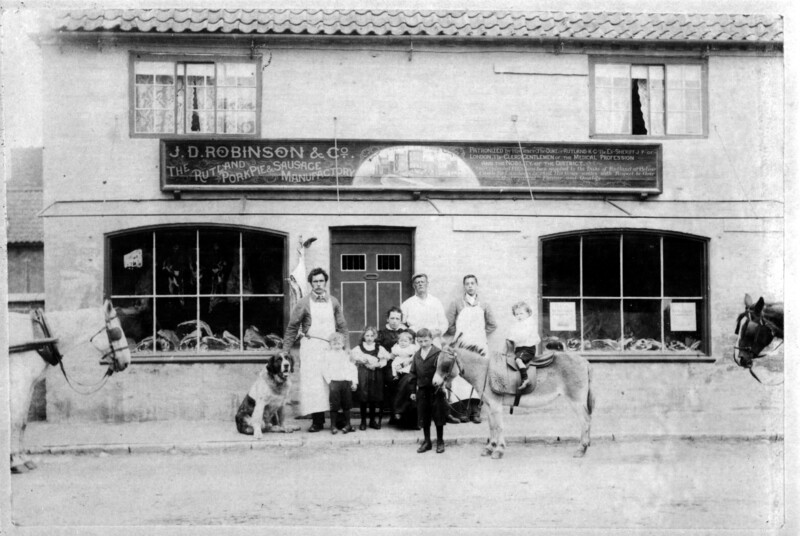 Robinson established a butchery business in Bottesford on Queen Street and then on Market Street. He also developed the Market Street premises, rebuilding the rear of the house and adding a slaughter house and bakery for use as the ‘Rutland Pork Pie and Sausage Manufactory’. The Robinsons had five children: George (born 1889), James (born 1893), Richard (born 1894), Victoria (born 1897) and Annie (born 1891). By 1911 the family had moved from the Market Street premises back to the ‘Mill House’ in Queen Street. J.D. Robinson was now farming with the assistance of George and John Richard was working as a butcher. The whole family then moved to the ‘White Lion Hotel’ Melton Mowbray, sometime before the 1st World War. After the 1st World War Mr. and Mrs Robinson moved to St Neot’s to run another butchery business. 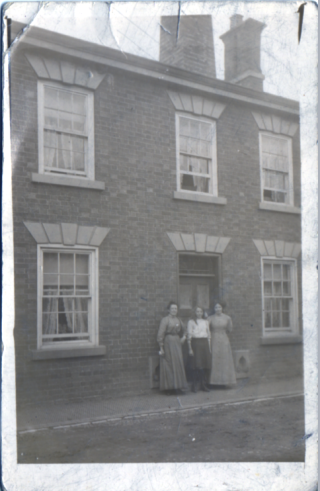 They then returned to the area to become the licensees at the Red Lion in Grantham and retired back to Bottesford in the 1940s to live at the Mill House on Queen Street. Mrs. Robinson died in 1944 and J.D. Robinson in 1947. 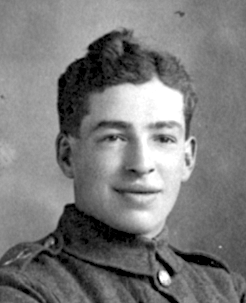 John Richard Robinson was listed as one of those 26, one of the ranks of volunteers from the Territorials required to reinforce the rapidly depleted ranks of the British Expeditionary Force. 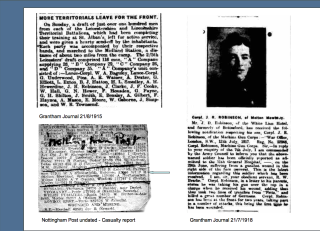 From that report we also learn that he was in the 2/5th Battalion, Leicestershire Regiment. However, that battalion did not go to France as a complete unit until February 1917. In the late summer of 1915 many territorial volunteers who opted for front lint service were posted to regular army units in order to serve alongside battle harden troops. ‘Pals’ and locally raised battalions arriving fresh from home training no longer served together in the front line. It would appear from a subsequent report in the Grantham Journal for the 12th July 1917 that John Richard had joined a machine gun company well before his original Battalion arrived in force on the Western Front. Corpl Robinson, in a letter to his parents, states that he was taking his gun over the top when he received his wound adding that “they took 2 lines of trenches from “Fritz” and killed a great number of Germans” He has been at the front for two years taking part in a number of attacks and this is the first time he has been wounded. It is clear that in early July 1917 John Richard’s father had made enquiries to the War office as to the whereabouts of his son. He is informed with the brevity of bureaucratic language of his son’s injury some time immediately prior to the 29th June 1917. It must have been a relief to receive a subsequent upbeat letter from John Richard describing how he was injured whilst ‘taking his gun over the top’. It is most likely that this is referring to a machine gun and not the routine carrying of a rifle. We also learn that he has already seen two years of service and taken part in a ‘number of attacks’. It might also be presumed that these could also have been with a machine gun company and that this is the first time he has been injured in the hazardous and exposed work as a machine gunner. Furthermore, by July 1917 he had been promoted to the rank of Corporal. We do not know to which particular Machine Gun unit he was attached. However, by the time of his death a year later during the German Spring Offensive of 1918 he was listed as serving as a Sergeant with the 5th Machine Gun Battalion. The 5th Machine Gun Battalion was formed in Italy on the 26th of February 1918 from the 205th Machine Gun Company and continued to serve with the 5th Division. If he had indeed been with the 5th Division for the duration of his active service in France John Richard would have seen extensive front line service. For example, by early spring 1916 the 5th Division was in a section of front line between St Laurent Blangy and the southern edge of Vimy Ridge, defending Arras. As the Battle of Somme commenced they were enjoying a period of rest and refit prior to their deployment on the Somme. By the 5th October 1916 the Division had left the Somme and was holding a quieter line near Festubert (S.E. of Armentieres in northern France). In comparison to the Somme it was a relatively quiet in that sector until March 1917 when they were engaged in the Third Battle of Arras. It is likely that John Richard was injured with the 5th Division in the one of the many engagements in the Third Battle of Arras. He may have recovered from his injuries by late 1917. If that were the case he would have returned to the 5th Division and further action in the 3rd Battle of Ypres which included the Battle of Passchendaele. At the close of the costly actions at Ypres the 5th Division was sent to Italy to assist Italian forces. However, it could be that John Richard, as an experienced machine gunner and as someone who would achieve the rank of Sergeant, remained on home service, perhaps at the Belton House Machine Gun Corp Training Camp, near Grantham, some 7 miles from his childhood home of Bottesford. Many experienced soldiers were posted on home service following injuries only to be recalled to Western France to stem of the onslaught of the German Spring Offensive in late March 1918. John Richard died whilst serving as a Machine Gunner during the Battle of Lys in the attempt to hold back the German Spring advance. To the memory of these British Soldiers who died as Prisoners of War in 1918, and were buried at the time in the Nouveau Monde German Cemetery, but whose graves are now lost. 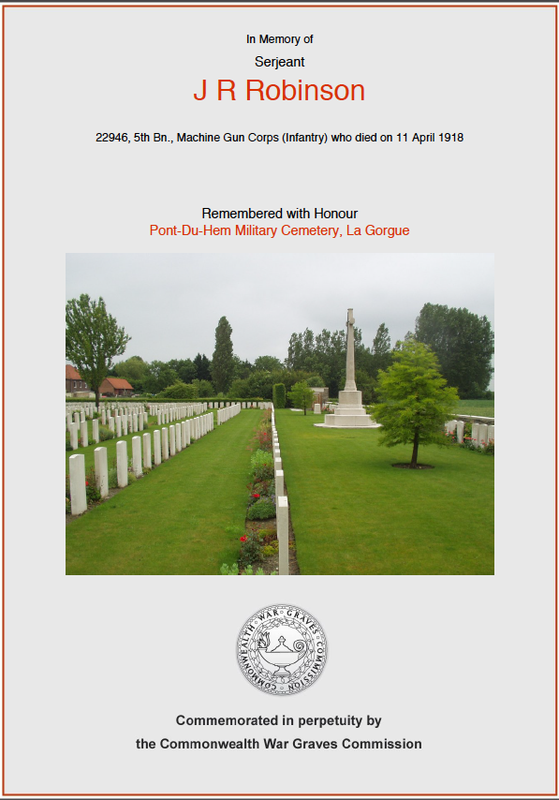 A special memorial stone was indeed erected at the Pont Du Hem Cemetery. However, its inscription is different to the one proposed in the above document dated 1925. More on that shortly. There is also a further discrepancy. 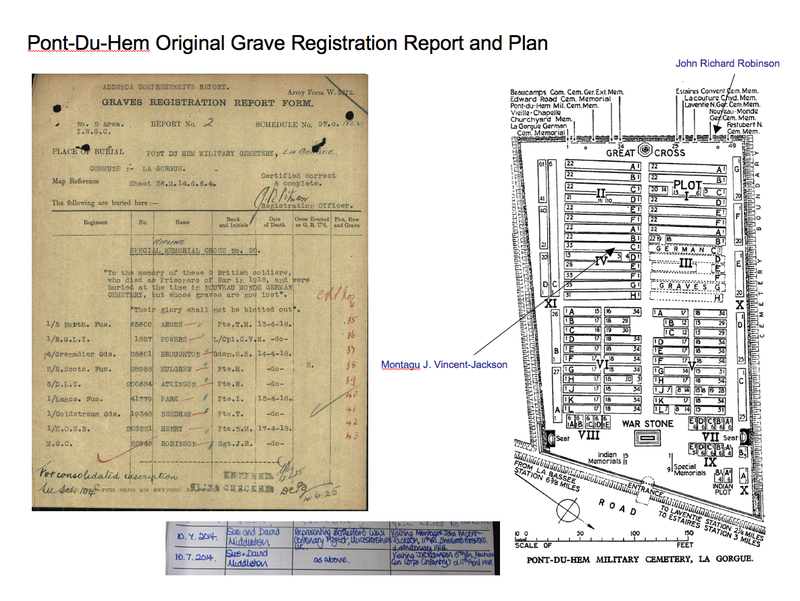 The Commonwealth War Grave Certificate gives the 11th April 1918 as his date of death and not the 17th April as given War Graves Registration entry. The 11th April is also the date in the of ‘Soldiers Died in the Great War’ listing. This discrepancy in dates raises two issues in trying to identify the precise circumstances of his loss. 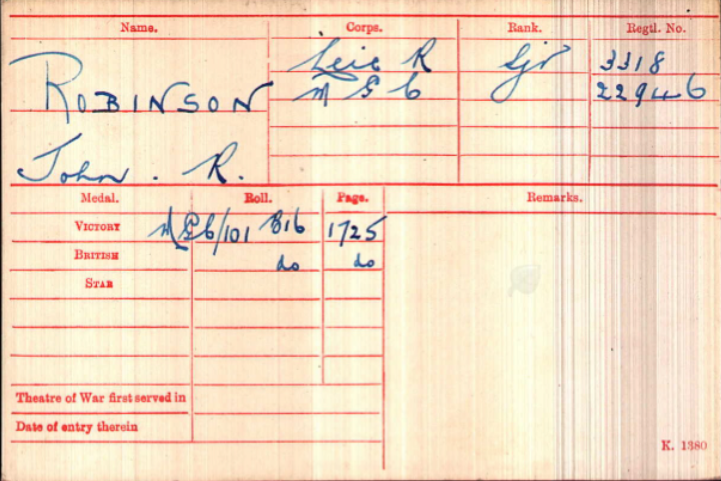 Was he taken prisoner on the 11th April dying six days later? Or is one of the dates a clerical error? 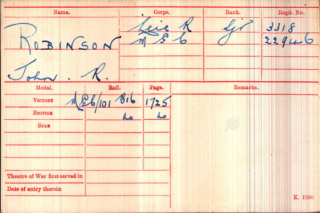 The 5th Battalion’s War Diary does not record the loss of any soldiers as prisoners for any date between the 11th – 17th April. However, it does record losses of named men for the 12th April as the 5th Battalion moved into immediate action after detraining at Aire-sur-la-Lys to counter German Forces who had broken through at Merville. John Richard is not listed amongst those men. The German advance continued westward. The exact circumstances of John Richard’s capture and death are not known. The site of the Nouveau Monde German Cemetery at Lavantie where he was initially buried would have been behind the German lines a small distance west of the Pont-Du-Hem Cemetery. After that initial action the 5th Battalion remained in Divisional Reserve until the 17th April with no recorded casualties. We therefore cannot be certain as to the exact circumstances of John Richard’s death except that he was certainly lost in the German advance and was most likely injured and taken prisoner very soon after his arrival in that sector. 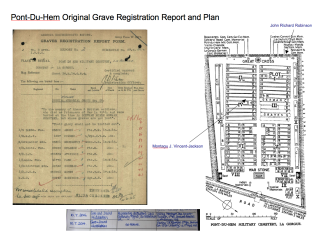 The Pont Du Hem Cemetery is not large. 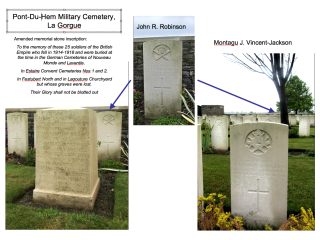 There are many similar cemeteries in this region of France. Against all odds two men from Bottesford lie together in the same cemetery. 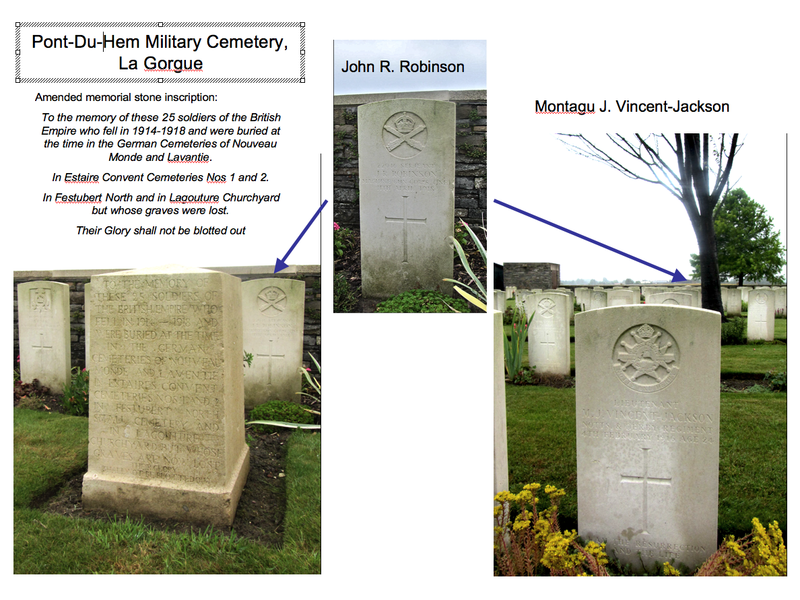 John Richard Robinson’s grave is close to that of Montagu Vincent-Jackson. Lieutenant Vincent-Jackson lost his life further south near Bethune two years earlier on 4th February 1916 serving with the 11th Battalion, The Sherwood Foresters. Montagu’s parents sadly died before they could have known the details of where their son was buried. We can never know whether John Richard’s family would have gained any solace from knowing that in his final resting place he is not alone.